Has time run out for Arsene Wenger? 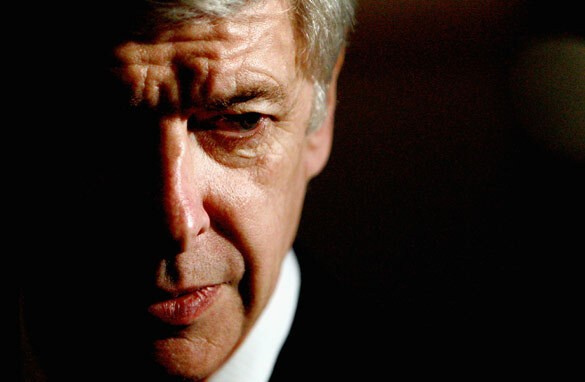 Arsene Wenger has led Arsenal to Champions League qualification in all of his 15 seasons. So, another season, another disappointment; a thought that will be meandering around the minds of many Arsenal fans following the Gunners' capitulation to Bolton Wanderers on Sunday and the realistic end to their title challenge. Manager Arsene Wenger, dubbed "The Professor" such is the reputation of his cerebral powers, will have more to mull over than most. It has been six years now since the Frenchman last led his men to silverware, when a side boasting Patrick Vieira, Ashley Cole and Dennis Bergkamp triumphed over Manchester United to win the FA Cup; and such barren periods for an elite club like Arsenal offer even the most vaunted of coaches little shelter from a torrent of criticism. The north London side have a pedigree to match many of the best clubs in world football and Wenger's early success, as well as their move to the stunning Emirates stadium, only cemented the expectation among the majority of its supporters that a team who once played a whole season without losing in the league would be champions again soon. But the wait goes on as, sadly, another season passes where it seems Arsenal have fallen just short of greatness. In a crumbling of confidence that has become something of an end-of-season routine, Wenger has witnessed a League Cup final defeat, a last-16 European Champions League exit and now the end of the fight for the title in a matter of months. There will be calls for the Wenger tenure to end, for the man who delivered so much to be deposed now his Midas touch has seemingly vanished. The 61-year-old is certainly in a more precarious position than a few seasons back, but to throw out the baby with the bath water would be a mistake. The Strasbourg-born coach after all built the modern club of Arsenal. He has never failed to qualify for the Champions League in 15 campaigns, has created some of the most aesthetically pleasing sides England has known and through shrewd acquisitions and a great eye for young talent he has competed at the zenith of the division despite mid-table spending. If there is one man who deserves a little more time to deliver at Arsenal then it is Wenger, especially if he retains the respect of the dressing room. But that is not to say he is not without fault. For a coach so experienced with winning it has been surprising to see his body language and behaviour as the business end of the season has crescendoed. His team obviously possess the skill to be the best in the land, but a strong mental resolve is needed to turn contenders into champions - and the squad would look to their manager for this mindset. In this respect Arsene has been absent. Alex Ferguson and Jose Mourinho are masters of dissipating pressure from their players. From their orchestrated press conferences where they exude calm and confidence, to their touchline body language and messages of motivation; time again their teams dig deep to get the result needed. Wenger, in contrast, has looked nothing short of a desperate man. Petulant in the face of results not going his way, continually adding expectation to a team over-burdened by the demand to deliver and a picture of nervous tension on the sidelines it is no wonder the feeling of anxiety has permeated his team. For be in no doubt, Arsenal's stumble at the last was a mental choke rather than a vacuum of talent. Wenger deserves to lead Arsenal to further glory in the future, his passion for the club is unrivalled, but he must rediscover the Zen-like qualities he was famed for when he moved to England all those years ago and leave the school-boy irascibility to the playground. I think Wenger iz stil de best for Arsenal.However he simply have to improve on overrelyin on immature boys and overpossesion.He should buy two or three experienced who can compliment with his current squad. Time has come for Mr. Wenger to go. Don't fire him....he deserve to be retired graciously. Hire a new coach who will go out and spend a little bit of money to get at least 3 solid defenders. he needs a finisher: like Villa, Chicharito, not specially a skilled player nut just one who can shoot one between the posts for a change. Wenger is the best man for Arsenal. I am not a Arsenal fan but Wenger did a lot for the club and for the boys. You have spoken about Wenger's body language and his eye for young talent yet you have missed several key points. Wenger does not teach defence. A defensive coach is needed. The undertaking of defensive training drills is a key value that is lacking in our current setup. Its not just the back line and keeper, its the whole team that needs to be aware of defensive duties and able to spot danger in its early stages. Wenger inherited a great back four and has never really adequately replaced the unit. On top of this, a goal poacher is needed to finish off our chances and our fullbacks need to learn to cross. You speak as if Arsenal fans are overreacting, but these are the same issues that have presented themselves for the last 5 years. How long does it take to realise that you cannot win without a defence? But how can you replace someone whose very name is Arsene(al)???! Love him, but it's time for the team to fulfil it's potential. We want them at the top again. wenger is still the best man for arsenal! !The team needs to jell well in order to win a silverware!! I agree totally with Naz. As a long suffering Arsenal fan, think this year's campaign (Premier league, Champions league, FA Cup) brings to the fore the fact that Wenger needs to agree to change tactics or JUST TAKE HIS EXPERIMENT elsewhere. In the match against Liverpool and the loss of a three-goal lead against Newcastle, you see a defence that is clueless. Every school boy defender knows that once you score against your opponent, you DEFEND! Please, Wenger, just GO! Ben makes a good point about Arsene needing to exude confidence, but the truth is, is that Arsenal weren't good enough. There is a vacuum of talent, the likes of Denilson, Almunia, Bendtner, even Clichy have not been good enough on a technical level. Its time to shake up the squad. I think its time for Wenger to move on. His philosophy of having a young team and spending as little as possible simply does not work. A perfect defensive coach would be "the special one if he wants the job". . He is always ramblig on about wanting to return to coaching England. Well getting Arsenal back to winning the EPL title agian and winning the champions league would be a good challange for the man known as "the special one'. I still believe if he does return to England to coach in the future it will be with Man United or Man city, but the Arsenal job would certainly be an attractive job for him, and the type of challange he would thrive on, trying to make them NO 1 in the EPL again, and win the champions league. Yes, it is time to move on Arsene. You'd make a wonderful accountant with a private company, cause you made Arsenal one of the richest teams in Europe, but us long suffering supporters need to see some silverware,not bank accounts, especially the big one that has yet always eluded us(Champions league). Take the big teams like Real, Barca, United, etc., they are all heavily in debt, but, what the heck, their fans are always celebrating this cup or the other. You've done great things to this club, but please, if you love this club, make space. We've become the nursery of european football, getting young cheap players, make them famous, then sell them at a profit, then what? more money in the bank! are we going to remain the team of the future? why do we need more money if you never spend any? So please, 15 years has been more than enough, only Ferguson has served longer with one team, but hey! what a difference their display cabinet! I realy had pitie for him this weekend. Do not doubt him...he is the one that can create from nothing the best result..He is not old and his ideas are working...every year a new name is arising from Arsenal's academies as the new "best thing"..Be patient and a title is close...very close! He's not going anywhere, even if Arsenal didn't win anything for the next 10 years. Why? Because Arsenal is the most successful football BUSINESS in the UK! You need to understand that the mentality of the Arsenal’s board and management; it is not about winning a trophy but about "making money". That was very evident when Wenger came out and defended his success (being in 2nd place & CL for the past 15 years in a raw). He gets players for a very low price or even free, lets them play at Arsenal for a couple of seasons then cashes in the big money when they are sold to other clubs. Don’t believe it; name the last time Arsenal paid big money for a star (they have been talking about Gary Cahill for two seasons but they will not buy him)!! And when they disparately needed a keeper, they brought in Lehmann. Why? Because he's free. So, as long as Arsenal is in the top 4, playing the Champions League and making money; who do you think will be their manager? Arsene Wenger should not be fired , he needs too realize that he needs too get solid players mentally and physically too play in the epl . They are a still relatively young team but they have played together for the last two – three seasons also which had been plagued with injuries too his best players. You are not going too beat the elite clubs with 2nd string players. The first leg against Barca last season 2-2 because most of them were fit the second leg Arsenal had seven starters injured . This year with the pace of Walcott in the first leg and it was a 2-1 victory. Walcott doesn't play the 2nd leg due to injury RVP the same not 100 percent and then sent off with a red card that the ref game him was ridiculous no team will win against a club like Barca with ten men. But it did start to all go down hill after the Carling Cup loss . You can only do so much when you lose your best players , when they played Chelsea the second time this season they dominated them because they were all healthy . Arsenal just needs too spend money if they want too compete with the likes of Man U,Chelsea,Man City , Liverpool and now Tottenham . So clearly the club have failed their biggest asset – their fans. We pay for the tickets, watch the games on Sky every Saturday, buy the merchandise. Clearly the club deserves to payback the fans. I disagree therefore that CNN thinks Arsene should stay. We must bring in someone like Mourinho and start winning trophies. Investors and players have had their fill. It's about time the fans started getting their returns. have faith Gunners, have faith in the professor, he will deliver, the wait will be worth it. Always Outnumbered, Never Outgunned, Arsenal for life! yes man he need a finishes like david villa who is ready to play for us.come on go for him i think he will help us to the ladder. I would not quite say that time has run out for Arsene. After all Arsenal still plays breathe taking football on the land. The Emirates is always full week in week out because people are looking for entertainment. Getting the ultimate price is one thing –but hey! They just fall short again this season. After watching the Liverpool-Arsenal match I felt Arsenal are now going all the way to win each and every game. But as usual they proved me wrong again. However I refuse to blame the players but Wenger. Wenger has displayed week in week out that either his team selection and/or substitutions are either wrong and/or untimely—take the game between Bolton and Arsenal for example he substituted Walcut at the time when Arsenal was constantly bomberding bolton. Who knows what might have happened had he allowed play to continue without substitution until the pressure dies down. It appears to me that he has a pre-determined notion that a substitution must take place irrespective of the state of the match–I think Wenger should correct his overall philosophy. I think goodbye is the best wishes for wenger,he didnt try at all. Arsene Wenger, dont let your first name "Arsene" deceive you into believing we cant do without you. you have overstayed your welcome, its time to GO! you have done alot no doubt but we need CHANGE!!! Am a die hard arsenal fan but so far my patience has failed me! Wenger just need to buy two experinced defenders not boys! Today is a big day for Wenger and the Gunners. I am eagerly waiting to watch them take on Fergie's Red Devils. so wenger makes a dream team and the players run away perpetually for money and not glory. now Fabregas will be knocking the doors of Camp Nou, then in a while Wilshere and Ramsey will follow suit...i think wenger should come up with a wage structure that will favor his players. another factor is that we lack experience, and this is evident when we start losing, we lose like an object in free fall...we need a Lucio to die for the team, we need a Maicon to score for the team we need a Felipe Melo to knock a few people in the mid because nobody does this.instead Van persie, walcot, nasri, arshavin fabre etc score goals and we conceed almost immediately...please wenger listen to me please...people kill themselves because of arsenal..its because we have this endless love for the team and whatever happens we are not quiting but we feel good when we win and better when we knock off manchester and tottenham...should i continue???? ?